A society based solely on logical conduct and “reason” is not possible. In this post, I will examine the second of these two problems. Rand failed to solve the is-ought problem in this paragraph: indeed, she succeeded only in misrepresenting it. Neither Hume nor Pareto deny that value judgments refer to "facts of reality." What they deny is that those judgments can be determined (or “validated”) by “reason” (or, in Pareto’s case, by the "logico-experimental" method). The reason for this is quite simple: no value judgment can be derived without reference to actual needs, sentiments, and desires of human beings, all of which Rand and her followers deplore as mere “whims.” To value something is to care about in the emotive sense of the word; and if you didn’t care about it or were incapable of caring about it, you wouldn’t value it in the first place. this little man-qua-man qualification changes everything. It's not just any kind of survival, but a very a special type, that we are to pursue. What precisely it is, though, remains somewhat nebulous. Rand clarifies "survival qua man" with the phrase "that which is proper to the life of a rational being." But since this is supposed to be part of an argument explaining how rational values are justified and generated, this will not do. Observe closely, for we are here confronting as good an example of circular reasoning as one is likely to find. When we ask Rand and her orthodox followers, How are rational values discovered? they answer By determining what is proper (i.e., moral) to a rational being! In other words, Rand’s attempt to bridge the is-ought gap collapses under the weight of its own ineptitude. Like every other philosopher of “reason,” she unwittingly equivocated her way to finding some vague solution to the problem so that she could pretend to be following “reason” instead of her own sentiments and desires. Now since Rand claims to have founded her politics on her ethics, her failure to demonstrate how an ought can be logically derived from an is will have obvious consequences for her politics. Most critically, it will allow us to dismiss Rand’s claim that her political values are founded on “reason.” Rand’s normative political theory is merely the statement of her own personal preferences. Therefore it is pointless to discuss whether Rand’s theory of rights is “correct” or “true” or based on "reason" or "man's nature." If we are to stick to the realm of facts and practicalities, we should instead focus on whether Rand’s political theories are empirically viable: that is, whether they can be implemented as realities, rather than just dreamed about as pleasant ideals. There are two problems with this view of non-logical conduct. A society based solely on logical conduct and “reason” simply is not possible. In this post, I will examine the first of these two problems. We flatter ourselves undeservedly if we represent human civilization as entirely the product of conscious reason or as the product of human design, or when we assume that it is necessarily in our power deliberately to re-create or to maintain what we have built without knowing what we are doing…. Many of the greatest things man has achieved are the result not of consciously directed thought, and still less the product of a deliberately coordinated effort of many individuals, but of a process in which the individual plays a part which he can never fully understand. They are greater than any individual precisely because they result from the combination of knowledge more extensive than a single mind can master…. [The] belief that processes which are consciously directed are necessarily superior to any spontaneous process is an unfounded superstition…. [The] spontaneous interplay of social forces sometimes solves problems which no individual mind could consciously solve, or perhaps even perceives, and if they thereby create an ordered structure which increases the power of the individuals without having been designed by any one of them, they are superior to conscious action… Insofar as such processes are capable of producing a useful order which could not have been produced by conscious direction, any attempt to make them subject to such direction would necessarily mean that we restrict what social activity can achieve to the inferior capacity of the individual mind…. In other words, Rand is admitting that in the past there was some real utility in non-logical conduct, but now that “rational” law has been (or ought to be) established, we can do away with Hayek’s spontaneous formations and found everything on “reason.” But if this is true, why stop with the law? Why not found economic policy on “reason.” Yes, I know, Objectivists believe that a rational economic policy entails laissez-faire. But that is a minority opinion among those believing in the supremacy of reason, most of whom are interventionists or socialists of one stripe or another. Before World War II, many intellectuals were convinced that “reason” supported socialism, because a system of production consciously directed and planned by experts seemed more “rational” then the “anarchy” of the market. Yet the fact remains that the so-called “blind” forces of the market do a much more efficient job of coordinating the factors of production than conscious reasoning on the part of a central planner ever could. An economy is far too complex to be governed by “reason.” Non-logical conduct therefore has an important place and society, and the prejudice against it is simply that: a prejudice. Taking Ideas Seriously Pt 2: Peikoff's "The Ominous Parallels"
Objectivists claim to "take ideas seriously," yet are notorious for bad arguments and worse scholarship. Regular ARCHNblog contributor Neil Parille continues his series detailing some key examples of this problem. (Part 1 here) This week, he examines Leonard Peikoff's debut "The Ominous Parallels." A larger problem is Peikoff’s assumption that the influence of ideas flows one way (from bad to worse) and that later thinkers will inevitably draw the conclusions that Objectivists assert must be drawn from bad ideas. Peikoff does not establish (or even attempt to establish) that his and Rand’s idiosyncratic understanding of Kant was accepted by German philosophers and intellectuals. In addition, Peikoff does not show (or again even attempts to show) that German intellectuals drew the political conclusions that he thinks are inevitable from Kantian philosophy. Such a demonstration would require the review of an enormous amount of literature (most of it untranslated) by German intellectuals from Kant to 1933. If Kant’s immediate followers were not collectivists of the Nazi variety, any claim that Kantianism leads inevitably to collectivism or Auschwitz (which Peikoff alleges was Kant’s “dream”) is rather dubious. From "The Last Waltz" of course, Rick Danko and The Band. In an age when political correctness, ideological myopia, political partisanship, and other sundry inanities have utterly mangled truth and clear insight beyond all recognition, nothing can be more to the purpose than an open and honest examination of some of the more salient issues confronting the civilized world. In Visions of Reality: Viewing Old Problems in a New Light, philosopher and independent scholar Greg Nyquist takes a fresh look at some of the central issues confronting civilized man in the twenty-first century, eschewing the conventional platitudes that have enveloped them and instead opting to go wherever the evidence leads. Essays on conservatism, democracy, moral externalities, the psychopathology of the left, economics, business cycles, and intuition all bring a fresh perspective on some of the chief problems tormenting mankind. The book concludes with two ambitious essays on the meaning of life. The essay "Realism and the Spiritual Life" attempts to give an unbiased, agenda-free account of the evidence for and against theism. 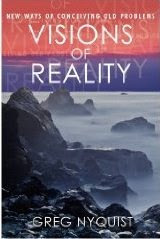 The book concludes with essay "Freedom and the Spontaneous Universe," which introduces a bold conjecture that rejects the determinism implicit in the cosmologies of neo-darwinists and creationists in favor of a vision of the universe that is compatible with mankind's experience of individual initiative and freedom. If you're a fan of Greg's writing here, or his previous book of which this blog is the namesake, "Ayn Rand Contra Human Nature", I suspect you're likely to enjoy it. That rational ideas (that is, ideas based on “reason and reality”) spread quicker than non-rational ideas—presumably because most human beings prefer “reason” to "non-reason." If … any one or more of the conditions for logical conduct are not present, then the actions are non-logical. Actions may, for instance, have no deliberate (i.e., conscious) motivation at all. This would be true of all or almost all of the behavior of animals; and Pareto, in spite of the prejudice of rationalists, believes it to be true of a surprising percentage of human actions [a view that is now receiving empirical support from cognitive science]. Taboos and other superstitious acts, which are by no means confined to primitive peoples, are obvious examples, as are many rituals, sports, courtesies. Human beings simply do things, without any [conscious] purpose at all; it is natural for them to be active, whether or not there is any consciously understood point in the activity. Finally, action is non-logical when the means taken to reach the goal are in fact inappropriate to that purpose. If … the carpenter tried to pound his nails with a sponge, then his means would be inappropriate, no matter how suitable he might himself think them. So, too, if … a democratic electorate believed that by voting a change of parties in power they might be guaranteed an era of endless prosperity. There exists a tendency in Objectivism to deny or belittle non-logical conduct. 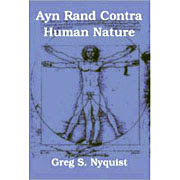 Rand tended to believe that human conduct is logically derived from an individual’s “premises.” This, in any case, is the implicit reasoning behind Rand’s view that human beings are the product of their premises. It is also behind her view that capitalism is incompatible with altruism and mysticism. She even went so far as to imply that non-logical conduct is impossible: “Capitalism and altruism are incompatible,” she characteristically wrote; “they are philosophical opposites; they cannot co-exist in the same man or in the same society.” It is difficult to take this statement altogether seriously; but it does betray the drift of Rand's sentiments, which is clearly opposed to the whole idea of non-logical conduct. Pareto’s remarks on this subject are helpful in several respects. They remind us that Rand is not the first philosopher to sing the praises of that vague, cognitively empty philosophical abstraction known as “reason”; and they also remind us that Rand’s very commitment to “reason” is itself non-logical, based, not on Pareto’s logico-experimental method (i.e., science), nor even on the pragmatic, trial-and-error reasoning of everyday life, but merely on Rand's own sentiments and wishful thinking and on her insufficiently detailed knowledge of "things in general." "I don't think anyone here is claiming that there is a *duty* to provide assistance. 'Duty' and 'obligation' are distinct concepts, and it is possible to have obligations without having duties." 1. something that one is expected or required to do by moral or legal obligation. 1. a moral or legal obligation. Clearly a hugely important "conceptual" distinction! "Reason" in Politics. Ayn Rand once described “rationality” as “a commitment to the fullest perception of reality within one’s power and to the constant, active expansion of one’s perception.” Using Rand’s description as a standard of rationality, how should the following assertions be judged? Which statements are “rational” and which are not? Fear of flying is irrational because many more people die in automobile accidents. A house with guns represents a greater danger to your child than a house with a pool. Rudolph Giuliani drastically cut crime in New York with his innovate “broken window” policing strategy. Which statements would an individual with a “commitment to the fullest perception of reality” likely accept? Answer: probably none of them. While all the statements seem plausible and even “reasonable,” they all rest on certain factual inaccuracies. Let us examine each statement. 1. Fear of flying as irrational. While it is true that many more people die in car crashes (40,000 per year) than in plane crashes (less than 1,000), it does not therefore follow that flying is safer than driving. The per hour death rate of driving versus flying is about equal. So neither form of travel is any riskier, in terms of mortality, than the other. 2. Guns more dangerous than swimming pools. Not according to the evidence. In the United States, about 550 children every year die in swimming pools, while 175 children a year die from playing with guns. 3. Giuliani’s broken window crime strategy. According to statistical analysis, it is not likely that Giuliani’s policing strategy had all that much to do with the drop of crime in New York. Economist Steven Levitt has found that New York’s drop in crime was largely due to four factors: more police officers, more criminals in prison, the waning of the crack of epidemic, and the passage of Roe vs. Wade. The greater part of the useful understanding we acquire throughout life is not explicit knowledge, but implicit know-how [i.e., Rand’s “just knowing”]. Our fundamental priority is not to be able to talk about what we are doing, but to do it—competently, effortlessly, and largely unconsciously and unreflectingly. And the corresponding need for the kind of learning that delivers know-how ... is not one that we outgrow. The brain-mind's ability to detect subtle regularities in experience, and to use them as a guide to the development and deployment of effective action, is our biological birthright.... Yet we ignore or disparage ... [unconscious intelligence] at our peril, for it turns out that there are things we can learn through this gradual, tacit process which d-mode [i.e., conscious reasoning] cannot master; and also that d-mode, if used over-enthusiastically, can actively interfere with this way of knowing. Claxton's views are fairly well supported by experiments in cognitive science. Unconscious cognition (more commonly known as intuition) is well documented in the literature. It turns out, then, that Rand was wrong on this issue and that reason is not the only means of knowledge. Looking back on our list, what do all four errors have in common? Well, in the first place, they are all plausible assertions—that much we can admit on their behalf. Any intelligent individual would likely consider each one a reasonable position to hold and might even be surprised that anyone would challenge all of them. The source of the error in all four cases involves an over-reliance on general information, which is used as the basis of premises from which common sense inferences that seem both reasonable and “true” are drawn. If many more people are killed in automobile accidents than on airplanes, doesn’t it make sense to conclude that traveling by airplane is safer than traveling by car? If we equate “reason” with science, logic, and clear thinking and we equate “unreason” with arbitrary assertions relating to altogether fantastic things, blistering contradictions, mystical revelations and other palpable absurdities, doesn’t it make sense to assume, with Rand, that “reason” is the only means to knowledge? But in relying merely on reasonable inferences based on general knowledge, we are failing to demonstrate a “complete commitment to the fullest perception of reality,” that is, we are not being rational in the Randian sense! Much reasoning done about politics by laymen is precisely of the reasonable-inferences-from-general-knowledge variety. It may seem true to a reasonable person. Yet this very quality of “reasonableness”—based, as it is, on incomplete and partial information—merely serves to conceal ignorance of important details and facts. Rand, even at her most reasonable, never got beyond this general knowledge stage. Her political reasonings, as we shall see, are therefore empirically unreliable. Q: Am I morally obligated to call for help if I see someone in a car accident or experiencing a heart attack? Peikoff: This is obviously from someone who does not know what the Objectivist view of selfishness is. Absolutely yes, you are morally obligated. If you have chosen to live in a society of human beings and your mode of survival depends on your trade with them then you have to value human life so far as it's not guilty or criminal to your knowledge. In that case if you know no evil about a person and no sacrifice is involved then only a psychopath would turn away from such cases. And that would mean besides all the psychological things a direct contradiction of the value of human life. You can't value your life and decide to live with others of your species and say, "They're nothing to me, I don't care if they live or die." That's self-contradiction. Actually, I think the closest Rand gets to "absolutely morally obligated" in these situations is a grudging "may be permissible" and no better in "The Ethics of Emergencies" (I don't have my copy handy), although it must be said this is a typically confused Randian essay. Can anyone supply a quote from anywhere in Rand which says helping a stranger in trouble is an "absolute moral obligation" or similar? If not, looks like the Doctor is freestyling, although I note that as usual Peikoff gives himself a have-it-both-ways-clause with the "no sacrifice involved" qualification whilst not providing us with any actual examples of what a "sacrifice" might be. At any rate, weasel-wording aside, the only thing that's clear about Rand's ethics is that little is clear about them. While "Atlas Shrugged"'s rise in the bestseller lists has been duly hyped as a sign of the times, it also seems that surprisingly few Americans are opposed to socialism. In the latest Rasmussen poll, only 53% of Americans favoured capitalism over socialism. This seems to be the result of a mix of factors, the state of the economy for one, and the understandable distrust of the financial elites who have consistently portrayed themselves as the apogee of capitalism. However, just as the "Atlas Shrugged" hype seems to have been strongly driven by the media (with endless plugs by Glenn Beck, Sean Hannity, Rush Limbaugh to name a few) a good deal of this softening attitude may be simply be a media phenomenon too - an unintended consequence of Republican PR tactics that have, since the fall of the Berlin wall, started portraying Western Europe (eg France, Germany, Sweden, Britain etc) as "socialist", and recently Barack Obama too. Trouble is, Western Europe is hardly the former Soviet Union, and Obama is hardly Stalin. In fact, they're both actually kinda...popular, whether to visit or to vote for. We might speculate that "socialism" isn't now associated in American's minds with the total government ownership of the means of production - for example, in another poll only 15% of Americans think a wholly government-managed economy is best - but instead with a set of popular programmes also regularly denounced as "socialist" by Republicans such as Social Security, Medicare, and the regulation of big business which despite being interventionist, still leave the vast majority of the economy in private hands. In other words, in their enthusiasm Republicans may have accidentally made "socialism" more or less equivalent to a mixed economy controlled by a representative democracy. Not so bad at all. We've already discussed the dubiousness of Atlas Shrugged's relevance to the current economic crisis, which seems to be largely due to a confusion between cause and effect. Now the great William K Black, investigator and author of the '80s S&L expose "The Best Way To Rob A Bank Is To Own One", accuses CEOs and management of a calculated dishonesty that lies at the heart of the problem. WILLIAM K. BLACK: The FBI publicly warned, in September 2004 that there was an epidemic of mortgage fraud, that if it was allowed to continue it would produce a crisis at least as large as the Savings and Loan debacle. And that they were going to make sure that they didn't let that happen. So what goes wrong? After 9/11, the attacks, the Justice Department transfers 500 white-collar specialists in the FBI to national terrorism. Well, we can all understand that. But then, the Bush administration refused to replace the missing 500 agents. So even today, again, as you say, this crisis is 1000 times worse, perhaps, certainly 100 times worse, than the Savings and Loan crisis. There are one-fifth as many FBI agents as worked the Savings and Loan crisis. BILL MOYERS: You talk about the Bush administration. Of course, there's that famous photograph of some of the regulators in 2003, who come to a press conference with a chainsaw suggesting that they're going to slash, cut business loose from regulation, right? WILLIAM K. BLACK: They're the trade representatives. They're the lobbyists for the bankers. And everybody's grinning. The government's working together with the industry to destroy regulation. Well, we now know what happens when you destroy regulation. You get the biggest financial calamity of anybody under the age of 80. [Pareto’s] basic premise with respect to human nature is that people’s motivations are inherently irrational and based on sentiment rather than logic, and that any reasons that individuals ostensibly present for their actions are in fact post-rationalizations. To this my response to Pareto would be a paraphrase of Rand: “If you do not consider people capable of genuine rational judgment, do not check their premises, check yours.” Certainly, some individuals, perhaps most of those who lack a systematic worldview, do act on whim and impulse, and Pareto may well have been one of them, which might have led him to attribute his own inner state to all others. Indeed, he had not presumed to use rational thought to justify the very premise about people’s sentimental motivations! He merely stated that the matter is out of the scope of the given treatise. This a typical example of muddled Rand-inspired analysis. First, we find the mania for polarizing arguments. Pareto, complains Stolyarov, believes in the “inherent irrationality” of human motivation. But that isn’t quite true. Human motivation is not, for Pareto, “irrational,” but “non-rational”—an important difference. Nor is Pareto required to use “rational thought” to justify his view: his book is not a treatise on psychology, and he addresses the issue in greater detail in The Mind and Society, which Stolyarov conveniently ignores. Even more curious is Stolyarov ad hominem attack on Pareto. Despite all their virtuous noise about logic, rank and file Objectivists frequently resort to ad hominem arguments, particularly of Stolyarov’s type. Stolyarov simply cannot admit that perhaps Pareto had reached his judgment about human beings from his own personal experience and his extensive knowledge of history! No, the only possible explanation is that Pareto himself is an irrationalist! Yet if this is so, why does Stolyarov spend the rest of his review extolling Pareto’s analysis and making use of Pareto’s intellectual tools for his own ends? If Pareto’s “inner state” is that of an irrationalist, then what can he possibly say that is of any value to a follower of Rand, particularly when what Pareto says about elites is partially based on the very theory about human nature which Stolyarov, in deference to Rand, presumes to reject? Stranger still, Stolyarov finds in Pareto an important Objectivist principles: the sanction of the victim! Can this really be? Can an individual whose inner state is confounded with irrational motivations be capable of anticipating a discovery of Rand by a half century? Well, not quite. While there are points of similarity between Pareto’s view and Rand’s on this issue, there are important difference as well. For Rand, the sanction of the victim occurs when the victim accepts the morality of the victimizer. According to Rand, businessmen allow themselves to be attacked because they agree with the morality of the attackers. That is not quite Pareto’s view. Pareto believes that businessmen who allow themselves to be attacked are merely cowards who are afraid to fight. Any agreement with the morality of their attackers is merely a rationalization to hide this pusillanimity. Alas, those very same “bland, predictable rehashers” of the Left have retaken power and are in the process of extending government well beyond what FDR or LBJ would, in their wildest dreams, ever imagined. Stolyarov’s analysis, posted in 2004, does not, in retrospect, appear in the least prescient. Where did he go wrong? Well, to start out with, perhaps Pareto was right after all about human beings being motivated by non-rational sentiments. Stolyarov also failed to note that, unlike Italy at the turn of the last century, American society is not threatened by any violent domestic faction. Stolyarov’s “socialist/hippie elite” is not going to be attacked with force by any neo-conservatives, libertarians, or Objectivists any time soon. As long as they feel safe, the Left will continue to hold its own on the political stage. Note that Stolyarov omits the religious right among his “multiple constituencies” opposing the “socialist/hippie” elite. Here is another possible source of error in Stolyarov: he would like to see the Left opposed by a “rational” elite. In this wish, he clearly misunderstands Pareto’s position. Pareto doesn’t necessarily conclude that all non-rational motivations will have a bad issue. Some may prove helpful. In politics, one can’t be too squeamish about alliances. The religious right was an important component of the Reagan revolution. Reagan doesn’t beat Carter without the help of religious conservatives. This very alliance, however, is regarded as sinister by Leonard Peikoff and other orthodox Objectivists, who regard it as a precursor of a theocracy! They believe they can “change the culture” by refuting Kant’s obscure subjectivist philosophical legerdemain. What would Pareto think of such a view? He would find it silly and patently non-rational. He might even suspect it of being a mere rationalization of powerless intellectuals afraid to own up to their own powerlessness. What do Objectivists want? A society in which all initiation of force is verboten. How do they expect to reach this state of affairs? By doing what intellectuals do best: caviling about obscure ideas. How wonderfully convenient! Too bad it isn’t true.